I have a family license and am trying to install 1Password on my wife's laptop. I can download the installer but when I try to run it, nothing happens. I get no error message - nothing. I have tried to open it, run as administrator, double click, etc. I can access our account through 1password.com, but cannot install the software to use it in Firefox. She is running Windows 10. Any suggestions or help would be greatly appreciated. Thanks. Same for me. I can install as admin though, but can't launch with normal user rights again. 7.3.654 hat the same issue on my machine running latest Windows 10. @dkeys @MrHashimoto installing as admin is not advised, as part of install 1Password needs to update few registry entries of current user, so if it's an install for admin user, it will not work well if started by regular user. It's hard to help without seeing logs or error records, please send us a diagnostic report as described here https://support.1password.com/cs/windows-crash-report/. update: corrected link to support site. This is the same problem I am having. I have nothing to show from a log file. Monitoring TaskManger after clicking the setup, shows the install program runs for 1 or 2 seconds and then it disappears. Nothing else happens. The first instruction to create and send a log file is to open 1Password. The whole point of this thread is that we cannot install it so clearly cannot open it. Not trying to be rude, but any other suggestions? If app crashes we expect an entry in Event Viewer. If app didn't crash but quit for some weird reason, we expect log files in %localappdata%\1Password\logs folder. Also, is there any antivirus solution running? Sometimes they can prevent app from even starting. How do I send you the Event Viewer crash report? I tried to attach it, but got a message saying file format is not allowed. Norton antivirus is running now, but I turned it off yesterday when I was having problems installing the app. No difference with antivirus and firewall turned off. 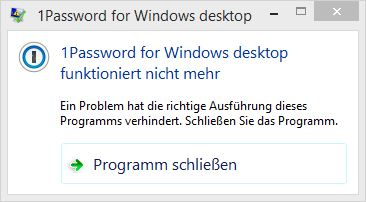 I also can't install 1PasswordSetup-7.3.657.exe on Windows 8.1 Enterprise. Beschreibung: Der Prozess wurde aufgrund eines Ausnahmefehlers beendet. @dkeys please email it at [email protected] and link to this thread, it will help us find correlation. We are particularly interested in errors from .NET Runtime source (like in post above). @reini thank you for sending us that report. I'll try to find Windows 8.1 Enterprise to run and test there. But from the first look it feels like .NET is either broken or out of date. In human it complains that it can't find resource in the app, but this is the same app and same resource as other people are using. We'll keep investigating. Meanwhile try to run .NET installer and make sure your system has all updates that it can get, sometimes there is a reboot or stuck update that can go unnoticed for months. The January 8th cumulative update KB4480056 is installed on my machine. Could you please specify the version of Windows you have on your PC? Do you have all of the updates installed? Also, have you tried to run .NET installer as Serge suggested above, reboot your PC, and check if the issue remains? I'm running Windows 10 with all recent updates installed. I tried to run the .Net installer, but it can't install anything, saying that a newer version is installed. BTW - Sorry for spamming the forum, but when I hit the post button yesterday, my post hasn't appeared, even after having reloaded the page. Do you have any AV/anti-malware software installed on your computer? I tried w/o, doesn't work. 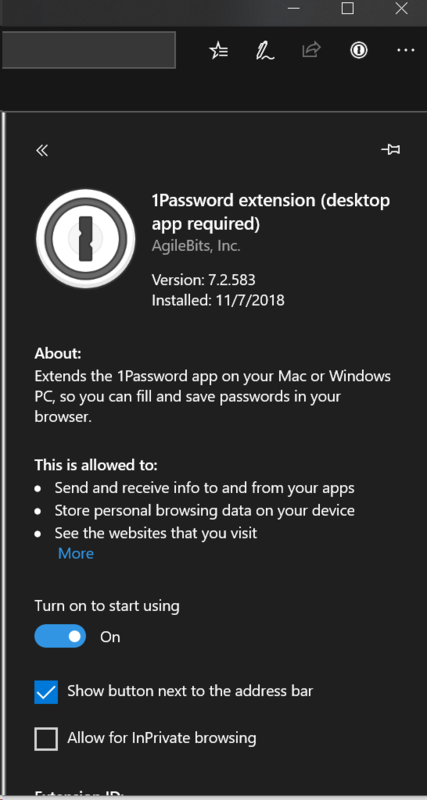 If you have 1Password extension installed in Microsoft Edge, could you please deactivate it for a moment and check if it makes the difference? 3. Run a registry cleaner to fix any fault links. Glad to hear you've got it sorted, @MrHashimoto! And, on Greg's behalf, you are most welcome. Same problem here on my Microsoft Surface Book with Windows 10 Pro. I can download the installer but when I try to run it, nothing happens. I get no error message - nothing. I have tried to open it, run as administrator, double click, etc. nothing works. I uninstalled 1Password 4 and all browser extensions, ran two different registry cleaners, deactivated the Auto-Protection of Norton Security and rebooted the system for several times. My system has all updates installed. Microsoft .NET Framework 4.7 installer says that I'm already on version 4.7 or newer. Please help. I'm facing the exact same problems as fkjoe. [2019-02-10 22:21:30.080231 +01:00] INFO [starter] src\main.rs:166: Installation successful! I have 1Password 4 trying to upgrade to a standalone 1Password 7. Windows 10. Chrome. .Net All up to date. It downloads. When I try to run the exe program nothing happens. No error message. No launch. I run Norton, but and I see Norton approve the file. Sorry for the troubles. Did you happen to install the previous versions of 1Password 7 (or 1Password 6) before and uninstalled it? Please try installing 1Password 7.2 from here and see if the installer works. If yes, you should be able to update to 7.3 after that (go to Settings > Update). Let me know how it goes. Thank you! I was able to install 1Password 7.2 without any problems. Afterwards I could easily upgrade on version 7.3. A long time ago I had a beta Version of 1Password6 installed and uninstalled it later. Great news! I am glad to hear you are all set now. Please do not hesitate to contact us anytime, we are always here for you. I had the same problem. Windows 10 installed on my wife's laptop. All updates installed. When I ran the 1Password installation, the install window opened and it installed. But the program could not start afterwards. The "Windows Event Viewer" said it could not run because it required the latest version of Framework.NET. But the latest version was already installed. 2. Go to start> Type CMD. 3. Right click and run as administrator. Then, the "system file check" runs .... and finds nothing. At the current start of the 1Password-Install everything works without problems and I am able to use 1Password normally. At least that was the solution which worked for me. Excellent. Thanks for letting us know!